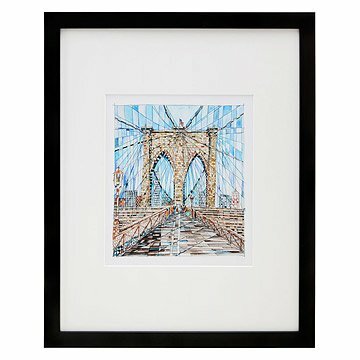 Celebrate the iconic Brooklyn Bridge with this mosaic-inspired art. Like a visual travel journal, artist Renée Leone's vibrant series of geographic watercolor paintings offers entrancing sights as seen through the artist's eyes. Renée combines her affinity for the geometric patterning used in textiles, mosaics, and stained glass to create city portraits that depict not only what she saw in a particular location, but, more significantly, what she felt. Brooklyn Bridge pays homage to one of New York's most iconic sights. The arches and criss-crossing cables of the bridge's design truly stand out with Leone's unique colorblock-inspired aesthetic. Framed in a black durian wood frame, with white FSC certified matboard (Artique), and Plexi. Gave this to a friend who was moving away from Brooklyn. She was thrilled. The colors are lovely and it is an interesting take on that classic bridge. Perfect picture of the bridge bringing many happy memories to my friend. Beautifully sketched! The print is beautiful, but for the price of $250, I wish it were an original and not a replica or at least that it was larger. We honeymooned in San Francisco and previously purchased "The Perfect View" (a view of the Golden Gate Bridge). We loved it. We now have the "Brooklyn Bridge" (we are native New Yorkers) and the two pieces work beautifully together. It is really lovely and my husband (born in Brooklyn) loved it. It is hanging in his office! A beautiful print given as a housewarming gift to my daughter and son-in-law. He is from Brooklyn and relocated so my daughter could be closer to home. Love him and the talent of Renee Loene. Packaged so very well, no concerns there. Can't wait to see it hanging in their new home. matted artwork is so nice; ready to hang. A wonderful gift for my daughter and her husband who live in Brooklyn. We have walked over this bridge numerous times.